John, you need to travel to Texas a little more often!! "Steak fingers" (as they are more commonly known down there) are a "staple" - and are found at any/all Dairy Queens there (but rarely found at most DQ's outside of Texas)... Yours look tremendous, though... Forget the BBQ sauce, though... You want some cream gravy for dipping!! Can't wait to try your version! 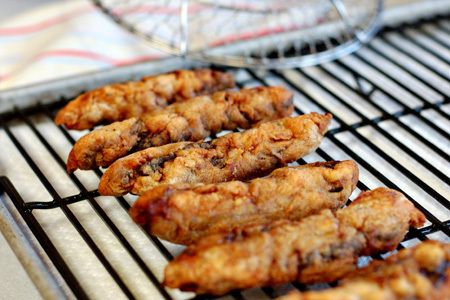 My hubby loves finger steaks, but I haven't found a recipe for them that is his favorite yet......yours may be the winner! Thanks. Hoochie - Texas? Oh, that small state south of Oklahoma? Leave it to Texas to get the name backwards and to use gravy. :-) I kid, of course. Hoochie is a good friend, y'all. Oh, steak fingers... Hard to find and so good! Thanks so much for the recipe - the picture kicks it up a notch for sure! These are spectacular. I've never had them or even HEARD of them before but this is 100% on my short list to do soon. You rock! I grew up on finger steaks a the Torch in the late 50s early 60s. I've searched the internet to purchase pre-made fingers. As I recall the only suppliers were from Idaho. There are a few taverns in Oregon where you can get them. I make my own! Similar to this great looking recipe. BUT, at the Torch we dipped them in HONEY!! Make them VERY spicey (add some cayenne) make sure they're salty enough, dip them in honey - heaven! Also great for venison. GREAT way to get people hooked on venison. The town I come from in Montana called them finger steaks and served them with bottled chili sauce. I have their recipe but I will try yours too. 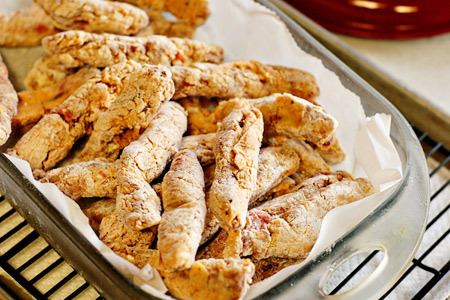 Of course they're called finger steaks in Montana. It's only Texas that has it backwards. :-) Again I kid, my Texas friends. Hey! I'm a Texan haha. Your words didn't offend me, though. As long as you give me some of those STEAK FINGERS, I'll forgive you. They look amazing! Do you people see what I have to put up with in the name of food?! :-) Hey, I went to Texas once, ONCE! That was where USAF bootcamp was, so I had no choice. BBQ sauce? Gravy is where it's at! Good ol' cream gravy. 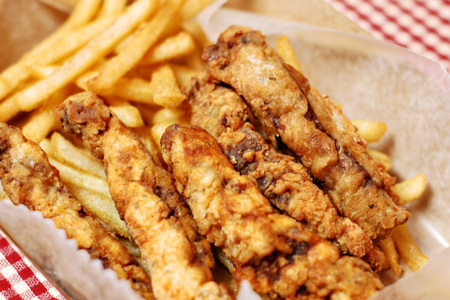 Finger Steaks are my absolute favorite thing ever. Really. Sooooo yummy. I'm from WA originally, and you could get really good ones all over. Here in SD, what they consider a finger steak is really depressing, honestly. Either you get something that resembles a NAKED finger steak (ie, no breading, not fried), or you get something that is absolutely soggy with grease beyond belief. Oh how I am looking forward to moving back to WA! I believe I come from the same town in Montana (Miles City??). Our favorite place to eat for a special occasion was the Airport Inn for the finger steaks. Ah, yes, the chilin sauce! I also have a recipe for finger steaks that taste like the Airport Inn ones, but I will try your recipe for sure. My husband ordered them in a restaurant in Billings, MT recently and hated them. Just freeze them long enough for the batter to freeze solid. That should take about 30-40 minutes. I used Lawry's seasoned salt and they turned out a bit too salty for me. When I make again, I will probably cut it to half in the flour mixture or eliminate it altogether in the flour mixture (I found a tsp on each side of the meat before flouring and dipping was probably enough for me). I used Guinness Stout, which was yummy! I used Tabasco hot sauce because that's what I had on hand. I can't say I even really tasted it so should probably follow your recommendations next time. I froze the steaks for an hour. They were not frozen completely but the batter stuck very well so maybe they didn't need to be? I am going to experiment with making and freezing solid ahead of time to see how they fry up quickly. I did not use a deep fat fryer -- just used a 4qt. pot on the stove and a fryer basket. My steaks stuck to the basket a bit and maybe that was due to the quality of the metal the gridded fryer basket was made from. 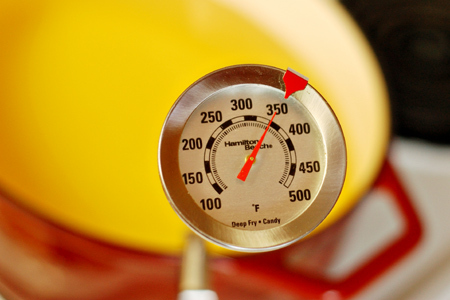 Finally, at 350 degrees, I found 4 minutes to be just about perfect. Since I'm not a regular fryer, I wasn't sure so had to experiment. Anyway, delicious recipe, my kids were happy (they dipped in ranch dressing because that is the universal dip at our house -- they are 11 and 9). We call them Steak Fingers in AZ too! I'm so glad you gave us this recipe - the one place we could get them out here is an hour and half drive from us. I never thought of making them myself! My husband had never had them, so I fixed these last night - he LOVED them! I'm so glad that you enjoyed them, Stacie. I love happy eaters. Where I come from they are called Steak Sticks. They are seasoned and rolled in beaten egg and then in crushed saltine crackers and then fried in a skillet with oil. (had Horseradish in it) YUM! Had them all the time when I lived in Boise at a Place called Manley's. Love them.